What is Torch Brazing ? Brazing joins parts by heating them to more than 840°F and applying a filler metal that has a melting temperature below that of the base metal. Filler metal flows into the joint by capillary attraction. Brazing has several advantages. Dissimilar metals can be joined. Assemblies can be brazed in a stress-free condition, and complex assemblies can be brazed in several steps by using filler metals with progressively lower melting temperatures. Materials of different thicknesses can be joined, as can cast and wrought metals. Nonmetals can be joined to metals when the nonmetal is coated. Metallurgical properties of base materials are not seriously disturbed, and brazed joints require little or no finishing. Brazing is typically done with a torch or in a furnace. Other methods include dip, resistance, and induction brazing. Torch brazing joins relatively small assemblies made from materials that do not oxidize at the brazing temperature or can be protected from oxidation with a flux. The most commonly used filler metals include aluminum-silicon alloys, silver-base alloys, and copper-zinc alloys. Flux is required with these filler metals unless protective atmosphere is used. Self-fluxing copper-phosphorus alloys are also used. Torch brazing is done in air and is the most common brazing process. 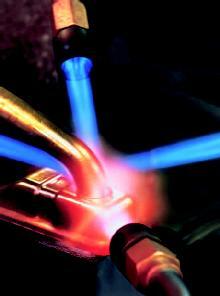 Normally, torch brazing is done with handheld oxyfuel gas torches using various fuels. However, there are automated machines that use preplaced fluxes as well as preplaced filler metal in paste, wire, or shim form. Torch and machine brazing are generally used to make lap joints in sections from 0.01 to 0.25 in. thick. Joints can be brazed rapidly, but speed decreases as material thickness increases. SOURCE What is Torch Brazing ?